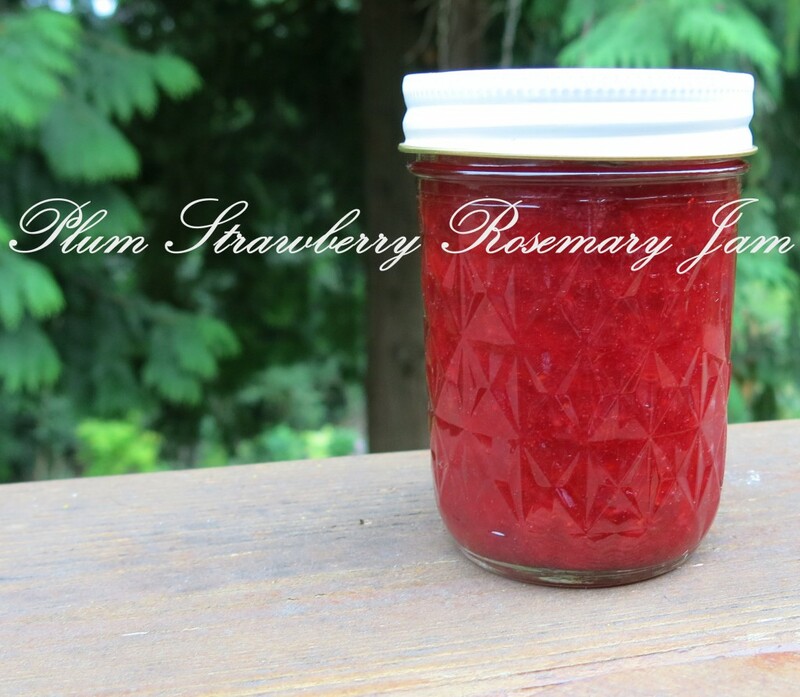 Adapted and contributed by Vivian Solomon, who was inspired by a recipe in The Blue Chair Jam Cookbook by Rachel Saunders, Plum-Strawberry-Rosemary Jam is a low-sugar cooked jam made with Pomona’s Pectin. Pomona’s Pectin contains no sugar or preservatives and jells reliably with low amounts of any sweetener. 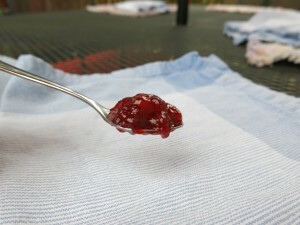 Vivian says: “The Plum-Strawberry-Rosemary Jam is a big hit!” It came out perfectly jelled with deep color and a bit of tartness. Note: This is a two-day jam. The berries and plums are prepared and mixed with some of the sugar, then macerated for 12 or so hours. Prepare calcium water. To do this, combine ½ teaspoon calcium powder (in the small packet in your box of Pomona’s Pectin) with ½ cup water in a small, clear jar with a lid. Shake well. Extra calcium water should be stored in the refrigerator for future use. 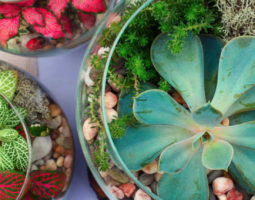 Wondering what calcium water is? Calcium water is a solution of the monocalcium phosphate powder (food-grade rock mineral source) that comes in its own packet with every purchase of Pomona’s Pectin. The Pomona’s Pectin directions tell you how to make calcium water with the calcium powder. 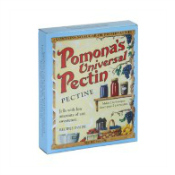 Pomona’s Pectin recipes call for calcium water because the pectin is activated by calcium, not by sugar. You can read more about calcium water here. 1. Prepare strawberries by washing, hulling, and mashing. 2. 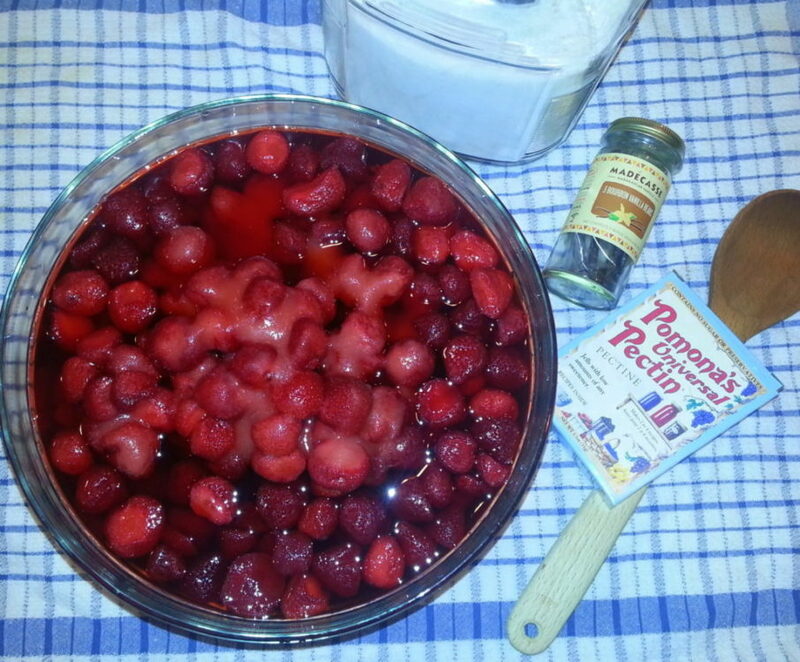 Prepare plums by washing, pitting, cutting into small dice, and mashing. Don’t peel. 3. Measure out 2 cups of mashed strawberries and 2 cups of mashed plums into a bowl or container with a lid. (If you have extra, save for another use.) Add ½ cup of the sugar and mix well. Cover and put in refrigerator to macerate for 12 to 14 hours. 4. The next day, when ready to make the jam, wash jars, lids, and bands. Place jars in canner, fill canner 2/3 full with water, bring to a boil. 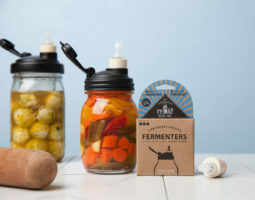 Turn off heat, cover, and keep jars in hot canner water until ready to use. Place lids in water in a small sauce pan; cover and heat to a low boil. Turn off heat and keep lids in hot water until ready to use. 5. Transfer macerated fruit into a sauce pan; add calcium water and lemon juice, and mix well. 6. Measure remaining sugar (1½ cups) into a bowl. Thoroughly mix pectin powder into sugar. Set aside. 7. Bring fruit mixture to a full boil. Add pectin-sugar mixture, stirring vigorously for 1 to 2 minutes to dissolve the pectin while the jam comes back up to a boil. Once the jam returns to a full boil, remove it from the heat. 8. Lay the rosemary sprigs into the hot jam, and gently mix. Allow to steep, covered, for 1-2 minutes. After steeping, taste if you like – the rosemary flavor will not be as strong in the finished jam as it is at this stage. Remove the rosemary sprigs, and stir the jam. 9. Fill hot jars to ¼” of top. Wipe rims clean. Screw on 2-piece lids. Put filled jars in boiling water to cover. Boil 10 minutes (add 1 minute more for every 1,000 ft. above sea level). Remove from water. Let jars cool. Check seals; lids should be sucked down. Eat within 1 year. Lasts 3 weeks once opened. NOTES from the folks at Pomona’s: I made this jam recently, with a few small changes that I want to share. I only had 1½ cups of mashed plums. I used Flavorosa, which is called a Pluot or Plumcot as that is what was available at my local farmers’ market. 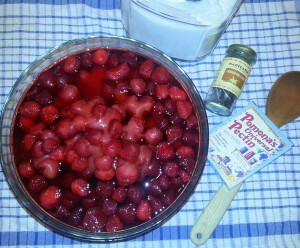 To make up for the missing ½ cup of mashed plums, I used 2½ cups of mashed strawberries, also from my farmers’ market. The strawberries were sweet, but the plum skins were quite bitter, so I put some plum skins in but not all. I prefer more tart, less sweet, so I did macerate the fruit in ½ cup of sugar (for 9 hours), but then stirred the pectin into only ½ cup of sugar – for a total in the jam of 1 cup of sugar, not 2 cups. And finally, I added a small pinch of salt (never more than 1/8 teaspoon) to the fruit mixture and I steeped the rosemary in the fruit for 2 minutes. I am happy to report that this may be the most delicious jam I have ever tasted! (My next favorite is Merry Mulled Merlot.) The texture, the color, and the taste are absolutely wonderful. Thank you Vivian! 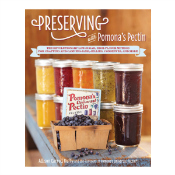 If you’re interested in learning more about preserving with less sugar, you can find more delicious recipes in the cookbook Preserving with Pomona’s Pectin by Allison Carroll Duffy. Looking for more ways to preserve those Strawberries? We’ve pulled together some of our favorites here. I have tried Pomons’s Pectin. Why do my jellies n jams look cloudy? I followed directions explicitly.